Whenever a particular milestone (i.e. a birthday or anniversary) is reached it is often customary to reminisce and recall the origins of the thing we are celebrating. With that said, this weekend celebrates the 81st anniversary of the first Manistee National Forest Festival which began when a group of like-minded individuals decided to do something different than what had always been done before. Summer festivals have had a long, storied history with the city of Manistee. Beginning in the late 19th Century, the main summer festival was called “Homecoming” as it was not only meant to celebrate the Fourth of July but for the purpose of welcoming former residents who had moved away back to Manistee. In conjunction with the Homecoming was a typical array of summer festivities which included dances, picnics and a parade. 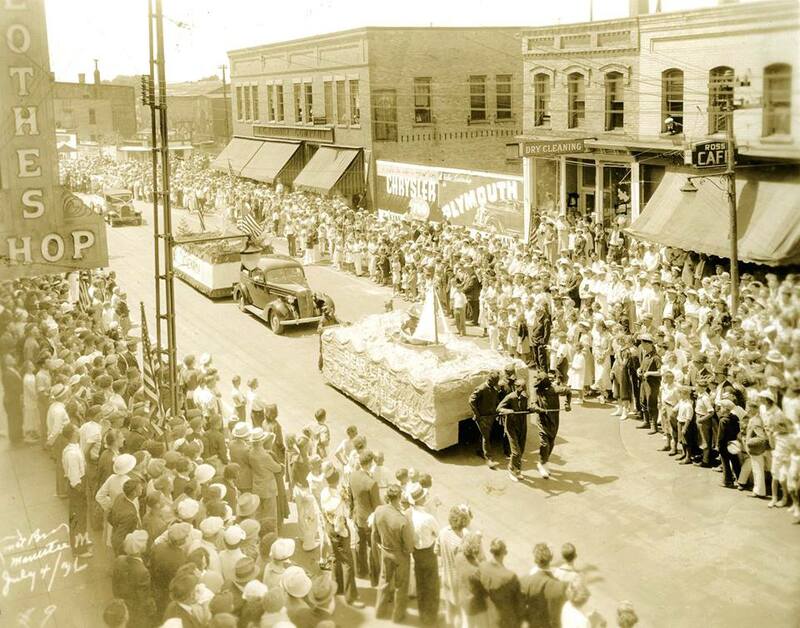 In the summer of 1935, the Homecoming Festival included a tour of the Manistee National Forest as well as a parade that included numerous Forest Service exhibits. With this aspect of the Homecoming deemed successful, it was decided that the next year’s summer celebration would be changed to a forest theme and would center on the Manistee National Forest Purchase Unit which was established in 1933. “From the rich, historic background of its early lumbering days and the promise held for future forest development through the Manistee National Forest, the city and county of Manistee will draw material for an annual Forest Festival that will rival any celebration in Michigan, according to plans formulated yesterday afternoon by a group of local men meeting in the forest ranger’s office in the federal building. The Festival, it is planned, will supplant the annual Fourth of July Homecoming, although old-timers will be invited back to attend each year, it will be national in scope, the first effort of its kind in the world to center attention upon the rebuilding of the nation’s forest resources. “Yesterday’s meeting of a small group of interested persons was preliminary to the formation of a Forest Festival Corporation, in which will be represented every organization in the city. On July 15, 1935 the Forest Festival Corporation was officially organized with Tom Hauck named President; Harry Musselwhite as Honorary President, Harold Hill, the first Vice President; Ted Brown the second Vice President; Ewald Pfeiffer, Secretary and George Kruse as Treasurer. Likewise a number of committees were formed to aid in the planning of the new festival. The committees included: a Planning Committee, Publicity Director, Special Housing Committee, Auditing Committee, and Finance Committee. The Forest Festival Corporation as well the committees also partnered with representatives from local organizations and businesses to assist in the celebration plans. Over the months, donations were sought through letters sent to chain organizations and firms that serviced local retailers. Other monies were donated through individuals and businesses and as the goal of $6,000 neared its mark, the local factories blew their whistles every time $500 was donated. On July 6, 1936 the first Manistee National Forest Festival was deemed a rousing success with over 50,000 people in attendance. The Forest Festival continued to be the city’s summer festival for the next several years but was later changed to the Sports Festival in the 1950s. After reverting back to the Forest Festival again, the summer fete was changed to the National Strawberry Festival in 1966. Finally, in 1977, it was switched once again to the Manistee National Forest Festival where it continues to be celebrated each Fourth of July holiday.